The consortium, made up of Echo Entertainment Group, Far East Consortium and Chow Tai Fook Enterprises, wants to transform its Treasury casino, converting the heritage building into a shopping centre. 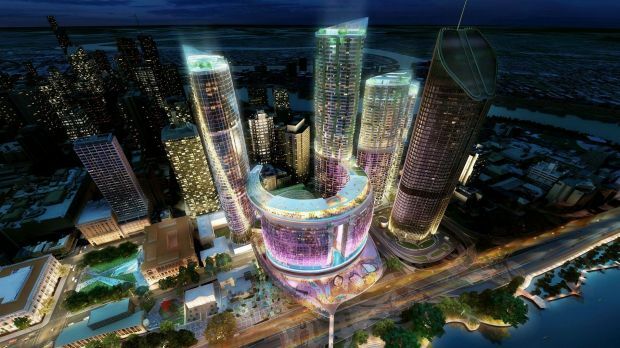 Echo Entertainment has won the Brisbane casino bid. Echo's win will transform Treasury into a boutique department store and hotel, with an underground shopping mall, "skydeck", five new hotels, with three to be rated six stars, a new Lyric Theatre at South Bank and a cross-river bridge to access it. It also promises "12 football fields" of public space. The bid presented by Crown and its Chinese partners included three hotels, a rooftop the size of the Gabba football stadium, public gardens and pools and its own bridge to South Brisbane, complete with waterfall feature. Destination Brisbane, the Echo Entertainment, Hong-Kong based Far East and Chinese Chow Tai Fook consortium and the Greenland Holding Group and Crown consortium were announced as the short-listed bids in December last year. With an announcement due early 2015, the project hit a timing bump following the change in power at the January election. Echo, which holds the city's existing casino licence at Treasury Casino, had been widely tipped to be the winning bid, but the Palaszczuk government asked for a few more months in checks, wanting, among other things, to investigate the "possibility" of retaining the George Street Executive Building, which sits in the middle of the planned project. But with the government admitting defeat in June, announcing that 1 William Street, the new Executive Building commissioned by the Newman administration, would house the government and larger public departments, stakeholders were just waiting for the tick off. Final bids were presented this month. After allowing its existing Queensland interests to fall by the wayside, Echo undertook a $345 million revamp of Jupiters Hotel and Casino on the Gold Coast and began renovations on the historic Lands Administration Building which houses its existing Brisbane casino, selling its Townsville interest in January 2014 to concentrate on its southern Queensland properties. The company's shares swung upwards in recent weeks, with investors confident the company had won the Queensland casino battle, having lost to Crown at Sydney's Barangaroo. Nothing re CRR integration mentioned yet ..
Any implications for Cross River Rail with Brisbane casino plan? As per the recent Qld 2015 Budget, Wonder if there will be a contribution from Echo for the CRR formally Bat Underground George St Station? In the UK, that would be a given. But this the backwards land of Oz! There will be demand for the station with potential patronage with new hotels and retail. People will be wanting to travel to and from the Airport and Gold Coast. For Echo to contribute will be a win win for The government (TransLink) and Echo + Retail in the area. HAHAHAHAHAHAH no. CRR probably won't even have started preliminary works by the time the Echo precinct is finished. What is the status of the land? Is it State Government land or private land or land to be leased to Echo? Knowing the 'Queenslander!' factor (and to mention affecting interstate projects lately), I wouldn't be surprised if it's "half-arsed" with "STRAYA!" thrown in. (Insert 4 letter word the 'cool' kids use after Straya). Travel home from the Casino Station should be free for punters who do their dough on the gambling tables and pokies. Perhaps the casino design should have a shute to the basement railway station for anyone who turns their pockets inside out, to reveal nothing. I thought the plan was to keep the Bat alignment (George St Station) but not incorporate the bus component ? Would appear that IF CRR ever proceeds (doubtful) it will be on Albert St (again). Beyond farce ... the foundations for these buildings will kill any tunnels is my guess. I can just see the "sky deck" and other public areas being used as vantage points for Riverfire. This itself will be great. It'll expand the areas to watch the fireworks significantly and might offer a little relief to South Bank. But what happens after the fireworks? South Bank handles the crowds with two train stations (with multiple extra trains) and multiple additional buses in the dedicated busway. Roads are closed to allow pedestrians to move freely. Can you imagine the chaos around Queens Wharf before and after major events like Riverfire? They might close roads to cars but they'll need to be open for buses. But where will the buses go? The reality is that without the underground train station (either George or Albert St), this development is going to face major issues once completed. ... "Cross River Rail still can run on the previous BAT tunnel route or other routes as are to be determined," Dr Lynham said. "We have taken that into consideration. The same feasibility with the BAT tunnel can still run through George Street." Throw away lines ... just like CRR ... it is never to going to happen, certainly not associated with Queensland Wharf development. Personally don't mind that CRR must now go back to Albert St. But whether it is ever built, well that remains to be seen. This is the state of ' aspirational ' projects. Glossy brochures, DVDs and I am hoping for some smart ' CRR ' smart watches that would be a nice touch. Is Dr Lynham the transport minister now? He seems to announce policy for Liquor and Gaming too??? Just saying! ^ OL has a point! ...The decision to award the Queens Wharf casino licence to the Echo-led Destination Brisbane Consortium has won the support of the city's Lord Mayor, who described it as a "game changer" for the Queensland capital. ... Cr Quirk's biggest criticism was the Labor government's decision not to go ahead with the previous LNP government's Bus and Train tunnel. The BaT tunnel would have had a station at Queens Wharf. "These facilities work best when you've got strong public transportation to the door," he said. Queens Wharf Development is keeping with a long tradition of projects in SEQ ..
" there'll be bus services running down George Street ... "
There are already bus services running down that part of George St, they just stop running at 6pm at night and don't run on weekends. Perhaps by 2021 we'll get an expansion in the span of hours of the City Loop to 8pm? Throwaway line indeed, from Dr Lynham: "Cross River Rail still can run on the previous BAT tunnel route or other routes as are to be determined." Has anyone with an engineering degree checked whether the Queensland Wharf development foundations are compatible with 'the previous BAT tunnel'? I thought new Labor didn't support the BAT proposal. Dr Lynham seems to be saying 'let's build the casino first and worry about underground and cross-river rail later.' BY THEN IT MIGHT BE TOO LATE. No worries, says Dr Lynham -- we can determine some other route. What are the other routes? What's viable, what's not? What are the soil conditions etc? Dr Lynham has belled the cat -- State Labor is not thinking CRR Mark III or IV, or wherever we are at now. No serious investigations are underway. Then what is Anna Palasczcuk seeking $1 billion for? Where is the project plan, what is the cost? Was anyone on the State side horse-trading with the winning proponent to have private money invested in an underground station? Seems not. What is the cost to the taxpayer of having to provide PT access to the new casino -- having the public purse supporting the development in that way? Perhaps by 2021 we'll get an expansion in the span of hours of the City Loop to 8pm? The historical trend militates against that - it mysteriously went from every 10 minutes to every 15 minutes at some point without announcement and so is already effectively useless. Unless it is halfway comparable to the CAT services in Perth it may as well not exist. Another very depressing circumstance for future transport in Brisbane .. Anyway, must be time for a song to lift the spirits! I think it is evident that Dr Lynham should have stuck to face (re)constructions rather than stumbling into the world of tunnel and casino constructions. The remark was sarcastic, I probably should have made that more evident. The Loop bus is a joke, it is faster to walk unless the bus is right there. I'd much rather see far-terminating of frequent routes at the Parliament precinct as a way to serve this area, rather than the loop bus and pathetic routes like the 105 and 202. ^ It was plenty obvious, my reply was half sarcasm itself! The whole inner city needs serious cleaning out sooner rather than later. BrizCommuter has spoken, after facepalming (again). While I think that not requiring the Queens Wharf developer to build, at the very least, a station box as part of their development is stupidity bordering on criminal; I'm not convinced that it would be wise at this point to require it either. I mean BaT was a funding program and a line on a map (and maybe a bit of geotech). That's not nearly advanced enough to start pouring concrete. CRR was better but still not much more than a glorified reference design and a business case without a funding source. And it didn't run down George St anyway. I can't help but think that the only thing more likely to get in the way of a future rail tunnel than building foundations and basements is an inconveniently located station box that was built in the general vicinity of where it was needed because somebody thought building something would be better than building nothing. It'd be like BAC asking airtrain to start building a new station for a future third airport terminal that might or might not be built on an as yet undetermined site somewhere within the airport precinct. The chances of something like this working out for the best are incredibly low. Not that it doesn't look already like a sadly missed opportunity, but this missed opportunity is not the real shame. The real shame is that the government still hasn't committed to when, where or even whether they will build a cross city railway, even as they continue to invest in growth and infrastructure that are hastening the need for it.